Celebrate all things March: Dr. Seuss, St. Patrick's Day, and some theater and dance going on around us too! 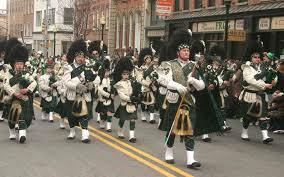 The 37th annual Morristown St. Patrick's Day parade begins with festivities at 10:30 am on the green with the parade kick off at noon! A celebration of optimism. Artists have united through the embrace of the color INT-O yellow (International Optimism Yellow) with the shared intention to shine a light on depression. The show kicks off our town's intiative to Paint the Town Yellow, a celebration of the International Day of Happiness (March 20). Adapted from the book by Rick Riordan, Percy Jackson is about to be kicked out of boarding school...again. And that’s the least of his troubles. Lately, mythological monsters and the gods of Mount Olympus seem to be walking straight out of the pages of Percy’s Greek mythology textbook and into his life. And worse, he’s angered a few of them. Saturday, March 11 @ 8 pm This full-length classical ballet tells a tale that is familiar to audiences young and old. Children and their parents (or grandparents) will surely recognize Princess Aurora, the Handsome Prince, the King and Queen and their splendid Royal Court, as well as characters from the fairy realm including the Lilac Fairy, the wicked Carabosse, Puss in Boots, Red Riding Hood, the Blue Bird and the Enchanted Princess. Sunday, March 12 @ 1:30 & 4:30 pm Dr. Seuss's most beloved character comes to life onstage to create an afternoon of mischief. With some tricks (and a fish) and Thing Two and Thing One, the fun's never done!